- Over the past five years I have been lucky enough to experience some great day hikes in the White Mountains. I enjoy all my hikes but there are a few that I continue to go back to when the weather is perfect because they leave a lasting impression. One of which is the one day Presidential Range Traverse. - On Saturday I headed back to the Presi's to hike with my friend Kelsey for her first traverse. Not only was it her first traverse but it would be the first time on each of the peaks! I wasn't worried taking Kelsey on the traverse, she is an Ultra-Runner and just this past summer has ran a 100 mile and a 50 mile trail run. She has put her body through complete hell and keeps getting back up, so a Presi Traverse hike would be a piece of cake for her! - I was excited because it would be my first time doing a regular traverse since 2010, the past three years I've done the 'Double Presi', my favorite of which was with Alton and Kat, so it was nice to have the feeling of roaming around above treeline without a care in the world! - The weather forecast was incredible, a true one in a million day above treeline. It was very warm for a mid October day, temps were in the 50's and only dipped into the 40's around Washington's summit cone and the wind was non-existent. The icing on the cake was the incredible waves of undercast crashing into the ridges. I have seen undercast before but nothing quite like this. Every peak below 4,000 feet was in the clouds, the rest rose up like cones out of a sea of white, the higher ridge lines blocked the undercast, the lower ridges had the undercast climb over then flow down the other side and dissolve into thin air, phenomenal! - Kelsey enjoyed every second of the hike, she got her first experience of miles upon miles of knee-hammering rock hopping found in the Northern Presidential Range as one navigates from Mount Madison south to Mount Washington before the terrain eases up past Mount Monroe. For twelve hours she lived in the moment and took it all in and hopefully will remember the day for a long time. 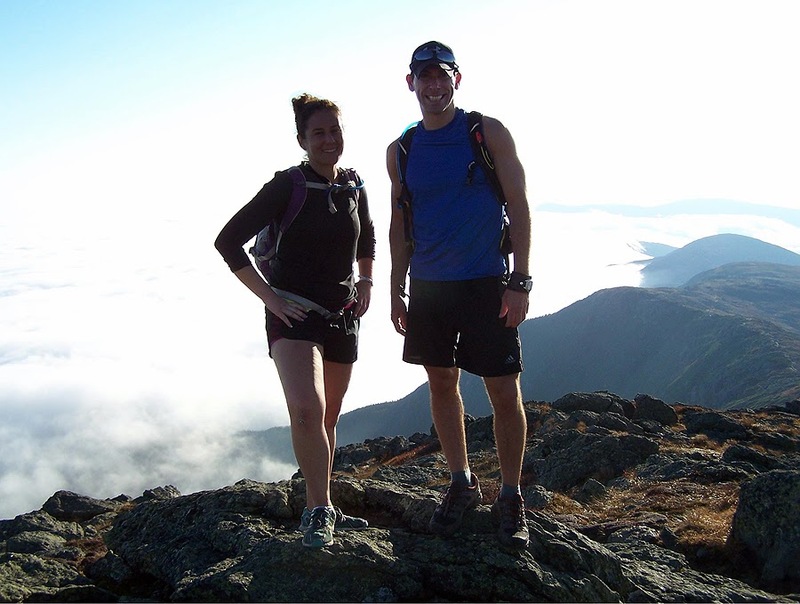 - We took our time, never trail running, just hiking and taking in the views from each summit. There were lots of people out, especially on Mount Jefferson, the most I've ever seen. Mount Washington, was a zoo of course, but I took us to the pack room to avoid the crowds before heading upstairs to grab a quick bite to eat before starting our second half of the hike. - The Southern Presidential Range on a day like this is very mellow and peaceful. Once past Mount Monroe the terrain feels soft and cushiony compared to the jumbled mess of rock north of us. - As we headed south and lost elevation we hiked down towards the undercast as the late afternoon sun combined with the long shadows from the summit cones of Washington, Monroe, and Eisenhower casted a cool mix of light and darkness along certain sections of the Crawford Path. - We got to hike through one of my favorite sections of trail just south of Mount Franklin, a spot I refer to as the 'Franklin Flats' just as the sun shined bright one last time over the small area turning the alpine grass into a golden state. Around this time we looked back north past Monroe to Washington and were able to spot the last two Cog trains descending the old tracks on the western shoulder of the rock pile, a surreal moment. - Next, we headed over to Mount Eisenhower and up the loop trail where we caught sunset from the summit. From our vantage point the sun was setting over the Twin Range with a blue, purple, orange, and red display of colors. Directly below us in the Eisenhower / Pierce col the undercast breached the ridge and slowly floated up, over, and down the Crawford Path. - Twenty minutes later we hiked through those very clouds and moments later we dawned the headlamps for the final short climb up to Mount Pierce. From the summit all that was seen were the lights from the Mount Washington Observatory to the north, the lights from the Mount Washington Hotel below us to the west, and millions of stars in the sky above. This would be our last few moments above treeline before heading back into the woods for the final three miles. Everything stood completely still, there was still not a breeze to be felt, and all was silent as we let out huge screams of joy from the bog bridges next to a cairn just below the summit on our descent. - The last three miles went by quickly, at one point Kelsey decided to pick a fight with a rock, the rock won, opening up an old battle scar and she started to bleed down her leg. She fell with a half mile to go! Keeping the saying true that it's not a hike until someone bleeds! - We got back to the car just after eight, just under twelve hours after beginning our hike. We had a celebratory beer and hung out for a while before driving back up to Appalachia. Dogs on the Appalachian Trail! nahhh! Next time, when I'm heading away from it! Mount Carrigain surrounded by a sea of foam in the forms of clouds! Kelsey taking a picture of me taking a picture! It's not a hike until someone bleeds!!! Well written, you captured the traverse perfectly and the pictures are outstanding! Awesome! The last pic is my sentiment indeed. Surface bleeding = Successful hike! Nice report. I read your entire blog in a few days - there's some great stuff in here! I have put the Adams Slide Trail on my list. I just did an abandoned trail up Mt. Percy today (google west side trail, if you're not familiar). Have you ever considered running the Grafton Loop Trail? I did a Pemi loop and was going to do the GLT but never quite got around to it. The base is nice and soft and the footing is generally pretty good. It's well marked and you have the benefit of easy cache locations because of its crossing with Rt. 26. Just thought I'd put it on your radar if it wasn't already there. What shoes do you recommend for trail running? Thanks. Keep up the amazing feats! Hi Michael! I am glad you liked the trip report and pics, much appreciated! You'll love the Adams Slide. Thanks for letting me know about the old trail up Percy, I will definitely have to check it out. I've never been to Mount Percy so it's good information to know! Thanks for the information on the Grafton Loop, I haven't done it but am hoping to get up there next summer to try it out. I'm pretty sure that was the course for MMD 2012, but am not sure. For shoes I wear La Sportiva Raptors or Ultra Raptors. They can handle every type of terrain from mud, to roots, slab, to the jumbled boulders found in the Presi's! There are other shoes like Brooks, Innov8, and Hoka so look at those as well. But I've only worn the Raptors, which might be slightly heavier but not by much but the support and grip on the bottom make up for that 10 fold. If you ever see me on the trail, make sure you stop me to say hi, I usually look like I'm on some sort of mission but I love to stop and talk to other hikers! Thanks Chris! Great report out!- I loved the part when we released our yells! it was great positive company as well- awesome time and I learned a lot about the trails too! :) and thanks for the vote of confidence to complete it, even though it took some time, it was great taking the time! I'm so happy I got to hike with you on your first traverse, it was a lot of fun and the views were the best I've ever had for it. Thanks again for a great day and I really appreciated your input on everything we talked about over the twenty miles! As always great pics. The undercast shots were amazing! Hi Ken! Glad you liked the pics, thanks! The undercast was the best I've ever seen, really lucky to have caught it, what a day / night to be up there with great company!